"Anxiety does not empty tomorrow of its sorrows, but only empties today of its strength." I mentioned in my last post that my birthday week had been a bit strange for me. I didn't feel ready to fully go into what happened when I made my last post, and I wanted my birthday entry to be about the fun things I did. Plus, it was a long enough post without the not so good stuff that happened. Don't get me wrong, nothing actually bad happened. And I have to keep reminding myself of that. I mean it felt bad, and it wasn't nice to go through. But I have to remember that it was all in my head, or else I run the risk of slipping back into the negative way of thinking that crept up on me out of nowhere. If you've read much of my blog you'll know I always try and be positive. I talk a lot about acceptance of things you cannot change, and looking on the bright side. I would go as far as to say one of my best qualities is finding the bright side of most things. I never say being happy is just that easy, but it's how I try and live my life. As I've said before though, I'm not perfect. I also go through dark patches, much like everyone else. It's impossible to be happy 100% of the time, and sometimes the choice is almost taken out of your hands. The brain is a very powerful, but faulty piece of equipment and no matter how much we want to feel a certain way or rationally know we should, our brains don't always cooperate. That in mind, this story goes back to the week before my birthday. I think I mentioned in one of my entries that I got a letter explaining what they were attempting to diagnose with the blood samples they took a few weeks ago. At the appointment I had had trouble hearing the doctor, so I was a little relieved when I got the letter. It said the reduction in collagen 6 seen in the muscle biopsy was in keeping with Bethlam myopathy. Against my better judgement I started Googling the relevant forms of Muscular Dystrophy, and came across one that sounded very like my own. I mean a lot of them are very similar to each other anyway. I got to the bottom of the fact sheet and it said the typical life span for someone with this particular form was 40 to 50 years. Now, I've always had a strange relationship with death. I've never really been afraid of it. Don't get me wrong, I'm afraid of how I might die, but death itself never really bothered me. I'm not religious, so I'm not afraid I'm going to burn for all eternity or something. I believe when it's over, it's over. Why fear oblivion? Still, when I read that little bit of info I felt this small sting of fear. Suddenly 40 and 50 seemed so close. I shrugged it off after a little bit and rationalised it. I mean I haven't actually been diagnosed with that form and even if I did have it, medicine could have advanced a lot between now and then, and what's more... I could go out and get hit by a bus tomorrow. I knew there was no point worrying about what ifs. After that I kind of forgot about it for a couple of days. Thursday (17th April) was a pretty normal day. I don't really remember what I did, I think I just relaxed. Before going to bed, Eva and I watched a bunch of YouTube videos. I felt fine and around 1am she helped me to bed. A little while later I was scrolling through Tumblr or something on my phone while I lay there and thoughts about what I'd read started to creep in again. My biggest fears for the future are that my breathing would get a lot worse (to the point I'd need a trachy) and lately that my swallow would get a lot worse. As I lay in bed I randomly thought 'if I was to suddenly stop breathing, would my bipap keep me breathing' and then as I became very aware of my breathing I started to think 'how do I know I'm actually breathing myself right now'. It didn't help that I'd been reading It's Kind Of A Funny Story by Ned Vizzini and it mentions Ondine's curse, explaining it as a condition where a person must consciously breathe or else they'll stop breathing. An obviously very irrational train of thought was forming, and I started to think if I didn't think about my breathing that I might stop. Suddenly I started to feel sick and I felt panicky. I realised I was being very irrational and took some deep breaths and started to feel better. I even tweeted about it. I thought I was fine and then around ten or fifteen minutes later everything came rushing back. I started feeling very sick, and my heart was racing. When I swallowed my throat just felt wrong, and I felt like I couldn't breathe again. My skin felt numb to touch. Particularly my arms, my lips and my throat. I felt like I didn't know what to do with my tongue, like I was going to choke on it. I was completely frantic. I'd never been so scared in my life. It was around 2am by now and everyone was in bed. I phoned my mum and she came in. I started shouting there was something wrong and I needed to get up. She called my dad and they got me on to the edge of my bed. Eva ended up hearing the commotion and got up too. I just kept repeating 'there's something really wrong, there's something really wrong. I can't breathe and I'm all numb'. I'm really not a very dramatic person, and put off going to doctors as long as I can usually. But I really felt like I was going to die, as silly as that sounds. I started telling my parents I needed to go to the hospital, that everything just felt wrong. I felt hyper aware of every function of my body, and at the same time felt like it was all just going to stop working. My parents checked my oxygen levels and they were down to 81 and they usually sit around 97 or so. My heart rate was around 130 to 140. Because of my levels my mum rang the emergency doctor, who said to ring an ambulance. My dad thought we were overreacting, but in that moment it all felt so serious. In hindsight, I think my levels read so low because I was shaking and my hands were cold, because when we read them again ten or so minutes later they were up to around 96. My heart was still racing though. I told my parents to give me a little time before phoning an ambulance, because I started to rationalise things again and realised it was probably a panic attack. At the peak of it, all rational thought went out the window and I really felt like I'd lost control of everything. My parents started to get a bit snappy with each other, and so I asked them to leave me alone with my sister. Even after I had accepted it was a panic attack, the physical symptoms still persisted. I still felt hyper aware of everything. My skin still felt wrong, as did my swallow and I still felt like I might choke on my tongue. My heart was still racing at around 130. I was sitting in my wheelchair and alternating between breathing myself and using my mask, trying to calm myself down. I started repeating to myself 'I'm alright, I have control of everything. I'm not sick. It was just a panic attack', basically trying to convince myself, because it was kind of a vicious circle. In my irrational state I was scared I was sick because of my disability, and the fear of that was causing the physical symptoms I was feeling that made me think I was sick. Although I had calmed down some, now and then everything would spike up again, especially when someone asked me how I was feeling. Eventually everything calmed down enough for me to feel okay for my parents to go to bed. Eva stayed up with me for a while, and then when I finally decided to try bed again, she lay on some cushions on the floor so I wasn't by myself. When I was in bed again the panic started bubbling up again. I felt like if I went to sleep, I might choke on my tongue or stop breathing. I knew it was irrational, but the problem with irrational fears is they don't always listen to reason. Especially when your body starts reacting to them physically. I couldn't stay in bed and ended up getting up again. I tried to relax for the next few hours and by 7am I was so tired, I decided to try bed again. By now Eva was sleeping in my bed and I asked her to stay in beside. For a while as I drifted off, I kept jolting awake. Like I couldn't let my body relax for some reason. Eventually I did drift off though. We were supposed to be going to the Ark Farm that day and we woke up around noon. I decided to see how I felt after breakfast and a shower, because I still felt anxious. I had trouble eating because my swallow still felt weird, like I was still afraid of choking. I did my best with breakfast, and then I had another mini panic attack while I was in the shower. The farm went well, and it distracted me from my anxiety for a good part of the day. It wasn't until we went in for food that I started to feel anxious again. Later that night I had another melt down before I was going into bed. The anxiety was bubbling the whole time, but eating and going to bed were the things that triggered the proper panic attacks. On Saturday night my dad had to read to me when I got into bed, because I had another one and didn't want to be by myself. It's almost amazing the physical symptoms they can give you. Despite not actually having choked since it all started, I was convinced I was going to choke every time I ate or even on my tongue if I didn't concentrate on not choking on it. And this was well after I knew it was a panic attack. "we're all just living day to day." And even though it was basically a variant of what my parents had said or even I had told myself, putting it like that really resonated with me. We really are. On Wednesday I went to the doctor, and he was brilliant. I was supposed to go about my face, but it had cleared up and I thought I'd use it to talk about my anxiety as it was still bubbling away. During the panic attacks my acid reflux had got a lot worse, because I wasn't eating for fear of choking. So I also needed anti-acids. I talked things out with him and a 10 minute appointment slot became about 25 minutes. Mostly him talking things out, not trying to rush me out. 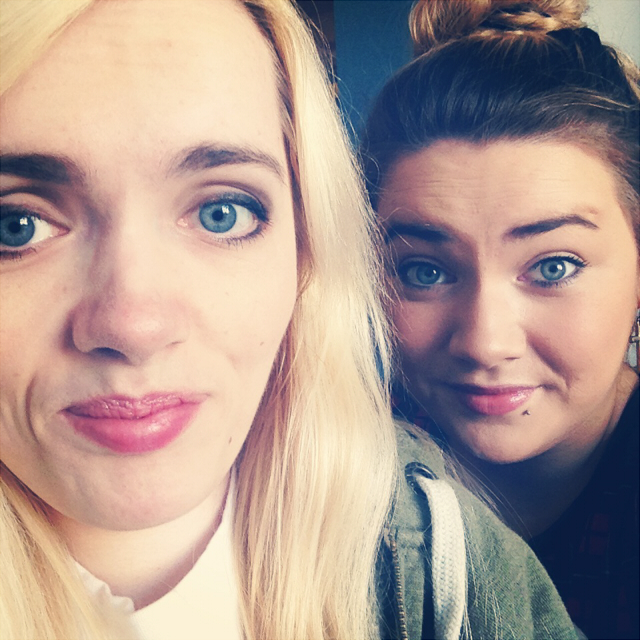 We spoke about me being diagnosed, my fears about my swallow and me moving out in the future. I think basically everything just got on top of me. He told me what I rationally knew anyway, that when it comes to MD it's a very wide spectrum and while there are some very mild cases and some very severe, most people fall somewhere in the middle. And nobody could predict where I would fall, and there was no point worrying about that. I realised over the course of the panic attacks that maybe my swallow isn't as bad as I've been thinking. I'm starting to think anxiety has been playing a big part in me choking. I haven't actually choked as much since I realised that maybe my fear of choking was what made me feel like I was choking. My doctor suggested some of the anxiety could be linked to the big changes happening in my life, whether I fully realise it or not. And I guess he's right. He didn't put me on anything for the anxiety, and I was glad. I don't think I wanted that. I guess all I wanted was reassurance. "If you want to conquer fear, don't sit home and think about it. Go out and get busy." Also, a shout out to Eva. She was a big help getting me back on track. The Charles Spurgeon quote hangs above my computer at work! I have to glance at it multiple times a day. I am a major stress-er. I have panic attacks often and it is the scariest thing in the world. My office at work is covered with positive quotes to help me calm myself. I know it sounds cheesy, but it really does help sometimes.